I served as an Infantryman in the Australian Regular Army for over 35 years including operational service in South Vietnam and Somalia finishing my career as a Warrant Officer Class 1 (W O 1). Since my discharge in late 2004 I have worked in the Fitness Industry as a Personal Trainer and Group Exercise Instructor. I have been active in sport all my life mainly Rugby League, Rugby Union, Boxing and Touch. I have led over 20 Kokoda Treks since 2007. Thanks to this experience, my military background and extensive research I am able to explain to trekkers the finer details of the Kokoda Campaign and the hardships endured by the brave men who fought so gallantly for our freedom. I am fortunate enough to live with my wife Cheryl in Palmwoods in the hinterland of the Sunshine Coast in Queensland. I have two children, two step children (all adults) and two grandsons. 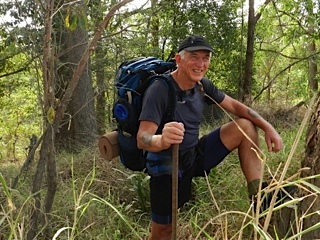 My passion is keeping fit and healthy and I aim to continue to guide trekkers over the Kokoda Track for many years to come and to assist them enjoy a life changing experience.